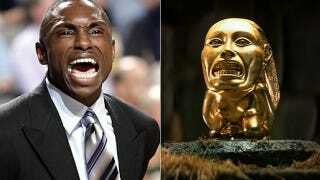 Separated at Birth: NBA Coach Avery Johnson, and the Hovitos Fertility Idol from Raiders of the Lost Ark? A figurehead atop a slowly sinking team, and a figurehead atop a slowly sinking stone. Separated at Birth is pure conjecture. It is not even half-assed genealogical research. Any resemblances are purely coincidental, no matter how hilarious.